If you’ve made your own templates, what did you use to do that ? Did it work ok ? i double the layer after cutting it. I glue them together. It is a blessing, to be a blessing ! Heat resistant template plastic for templates that I use over and over. Less than $3 for 12" x 18" at a store near me. Also some mailed advertising cards are "plastic dipped"! When Jim worked at the hospital, he brought home some 8 1/2 x 11 sheets of plastic that I use. They are sturdy, but I am still able to cut them with ordinary scissors. I love them, and wish I had more. He also saves the tops from the coffee cans for smaller items. I use those plastic sheets. I think they are like 8 x 11- like copier paper size. I like see through rather than using cardboard. I don't use templates very often anymore though. I used to use them a lot. Sorry my question was so broad. I was looking for a product with some thickness similar to my quilting rulers. I like the creative Grids patchwork templates for crazy quilts but I want to make scrappy 10” or 12” blocks and they don’t make templates that large. I heard about using linoleum but the top would be too slick and the bottom would have the black goop on it. I want to use my rotary cutter so I’ll look at the hardware or fabric store. Thanks. Some use acrylic from the hardware stores, and I think they will cut it to your sizes too. I have glued together a stack of dimes for circles. You could do the same with other coins for larger circles. Remember, if you have a quarter inch foot on your machine, the circle comes out with a diameter that is a half inch larger than your stack of coins. If all your lines on your crazy quilt are straight, then why not use regular paper? You would draw the pattern out the first time as to where you wanted your seams. Office supply houses have the bigger pieces of paper. 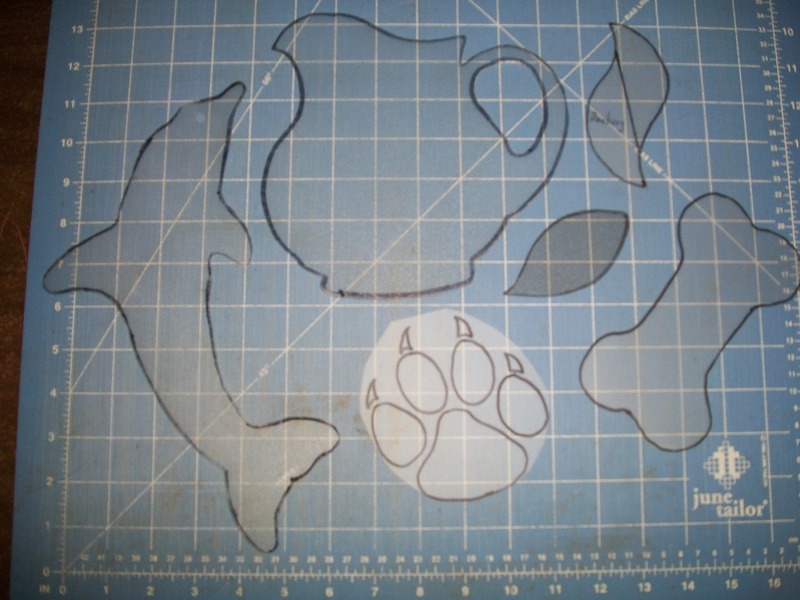 Then cut apart your original pattern, add 1/4 inch all the way around each piece and copy them. Number your pieces or you will be one confused person. Then just layer your fabrics and cut each piece. After doing some Judy Niemeyer patterns, I can cut 12 layers of fabric with the largest rotary cutter. It is a workout! If your template has straight sides like squares or rectangles, I go to Lowe’s and have them cut it for me out of their plexiglass. If it has curves, then I get my son to cut them out for me. It cost me about $1.50 to get a nice template that I use with my rotary cutter. I ask them to use their leftover plexiglass as my pieces are rarely larger than 10 x 10”. I haven't heard of using linoleum before but if you know someone who lays tile you might ask for broken pieces of leftovers that they are going to discard. These wouldn't have the adhesive on the bottom. You might even stop by a house under construction and ask the contractors. Bet they would be glad to give you a few if they're using that. I go to my local hardware, take them a pattern or tell them the size I want and they cut 1/8 inch plexi glass templates for me. I use a permanent marker to make an " X " thru the middle to easily determine the middle of my block. This would only work for basic circle, rectangle or square shapes and, of course, doesn't have any other accurate markings. The cost is usually under $5....less than commercial templates. I went to Tap Plastic and got some templates made. The were geometric shapes, squares, rounds, etc (simple shapes). However, I never asked them if they could make more intricate shapes. Also took a class from a well-known quilt teacher (so well known that I can't think of her name at the moment, I need more coffee!) and she made templates out of the laminate plastic that you would glue onto a kitchen counter. She said that her husband cut them out with a jig-saw. They were well-made and I still have them 30 years later. I go to a local plastics company. They are so great. I had them make my DSM table tops as it was much less expensive than a sew steady table, and I could have the tables the size I wanted. We have a Tap Plastics near by so if I intend to use the pattern more than once I usually take my template pattern to them and have them make me an acrylic template ... usually fairly inexpensive ... If it is a one time use I use template plastic from Joann's or cardboard. If you can draw out the pattern pieces with the seam allowances on a piece of paper, you could get a couple of peel and stick 12 floor tiles from the $ store. Peel off the paper and stick your pattern pieces on it. You would need heavy duty scissors or an exacto knife to cut out the shapes along the seam allowances on your paper. This should give you your pattern pieces to use with your rotary cutter.